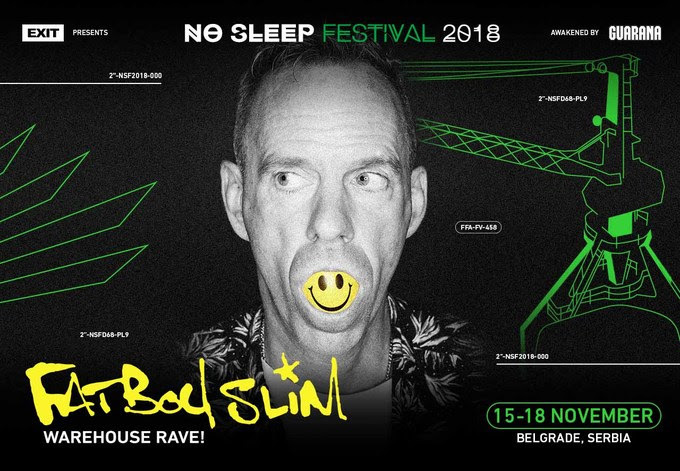 Fatboy Slim will headline Thursday, November 15th at No Sleep Festival, a new event in Belgrade from the people behind EXIT. Described as a warehouse rave forming part of the multi-location festival running from the Thursday to Sunday, November 18th, Fatboy Slim will be joined by DJ Tennis and Marcel Fengler back-to-back. Meanwhile, confirmed for the Friday of No Sleep Festival are Nina Kraviz, Dax J, I Hate Models and Alexi Perala. No Sleep Festival will see three all-night parties at New Hangar in the Port of Belgrade plus after and daytime parties at clubs such as Drugstore and 20/44, plus bars, record shops and gallaries. For tickets and details go to nosleepfestival.com.